Airstrikes in Iraq: 10 reasons why our intervention won’t escalate into war. Yes, we’re bombing Iraq. But the U.S. intervention is not going to escalate. Iraqi Yazidis demonstrate against the threat imposed by ISIS outside the U.N. offices in the Iraqi city of Erbil on Aug. 4, 2014. The U.S. military has returned to Iraq. Last night, President Obama authorized airstrikes to stop ISIS (which now calls itself the Islamic State) from advancing on Erbil, the hub city of Kurdistan, and protect 40,000 refugees trapped on a mountain. War-weary critics say Obama’s intervention will lead to all-out American military engagement. Hawks protest that he has no vision and that his limited intervention won’t defeat ISIS. Both sides complain that he has no end game. They’re wrong. Military intervention doesn’t have to fit into a strategy for military victory. It can make sense on more modest terms, as part of a larger political process that is moving in the right direction and is driven by other players. When miscreants such as ISIS endanger that process, a timely use of force can contain the damage and preserve the momentum. We don’t have to wage a larger war in Iraq. Here are 10 reasons why we won’t. 1. ISIS will destroy itself. We don’t have to stamp out ISIS, because its growth is inherently limited. It picks too many fights and alienates too many people. It has already taken on the Iraqi army, the Kurds, the Turks, Iraqi Baathists, and many Iraqi Sunnis. Now it’s going head to head against Syria’s armed forces. As if that weren’t enough, ISIS went into Lebanon this week. ISIS also antagonizes civilians in its territory. 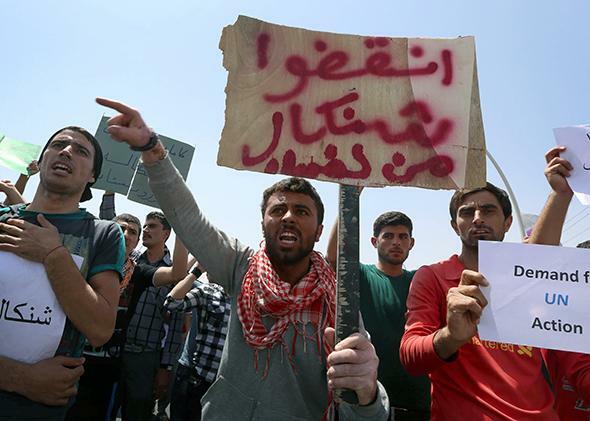 People in Mosul are rebelling against its oppression. It won’t last. 2. Local powers have the ability to contain ISIS. Remember when ISIS was advancing inexorably toward Baghdad? Since then, Shiite militias have mobilized, and the front hasn’t moved. Last night, when airstrikes on ISIS positions were heard near Erbil, U.S. officials said the strikes weren’t ours. Somebody else, probably the Iraqi air force, is pounding ISIS. 3. We’re doing what only we can do. Lots of countries and Iraqi factions have a stake in stopping ISIS. But some tasks are beyond their power. Saving 40,000 people on a mountain seems to be one of those tasks. In his speech last night, Obama said the U.S. should step in when it has a mandate from the host government and “when we have the unique capabilities to help avert a massacre.” Unique is an important caveat. It means we’ll stick to doing what others can’t do. 4. Obama knows the long-term solution is political. “There’s no American military solution to the larger crisis in Iraq,” he said. “The only lasting solution is reconciliation among Iraqi communities.” This isn’t like the post-9/11 invasion of Iraq, with a military goal of regime change. The role envisioned for armed conflict is narrow. 5. We’re holding back our power as leverage. “Once Iraq has a new government, the United States will work with it and other countries in the region to provide increased support to deal with this humanitarian crisis and counterterrorism challenge,” Obama said. Translation: We could do more, but we won’t until Iraq’s politicians do their part. On background, U.S. officials signaled that this means we’re waiting for the government to get rid of Nouri al-Maliki, the country’s divisive prime minister. 6. The political process is working. The ISIS threat is forcing Iraqis to set aside their differences. After years of withholding help, Maliki is finally giving the Kurds air support. Better yet, Maliki is cooked. For a while, it looked as though he’d hang on to his job. But in the last few days, even his own party has made it clear that he’s done. 7. ISIS has no friends. “None of Iraq’s neighbors have an interest in this terrible suffering or instability,” said Obama. So as long as we confine our intervention to crippling ISIS, no country will fight us on its behalf. 8. Some force now means less force later. You can’t deliver humanitarian aid in a war zone without military support. The cargo planes we use to drop food and medicine fly low and slow. If one of them is shot down, imagine the escalation. To forestall that scenario, we’re sending limited air power up front, in the form of fighter escorts. Good move. 9. Sometimes you just have to keep the players in the game. Remember the U.S. economic bailouts of 2008 and 2009? If Obama and President Bush hadn’t propped up major companies and financial institutions, the loss of those institutions would have left the government with an even larger and more direct role in the recovery. What’s happening in Iraq is similar. Kurdish forces are reeling. If we don’t keep them from collapsing, they won’t be able to play their part in rolling back ISIS. 10. If we don’t intervene now, the refugee crisis will get a lot worse. Nearly 2 million Iraqis have fled their homes. Around 200,000 are on the run from the current ISIS advance. Panic drives people out even before ISIS arrives. To control the crisis, you have to stop the panic. The arrival of American force, even on a small scale, is one way to do that. That’s why the torrent of people fleeing Erbil slowed after Obama’s announcement. “The bombing changed the mood of the people,” says a Kurdish officer. Military history is full of mission creep. But just as often, force is applied within limits. Before 9/11, we enforced no-fly zones in Iraq for years. Israel pounded Gaza for a month but pulled out this week after demolishing Hamas tunnels. (The shooting has resumed, but that wasn’t Israel’s decision.) The U.S. has been sending military aid to Ukraine, but the aid is nonlethal. It’s possible that Obama’s airstrikes in Iraq will escalate into full-scale war. But there are lots of reasons to think they won’t.